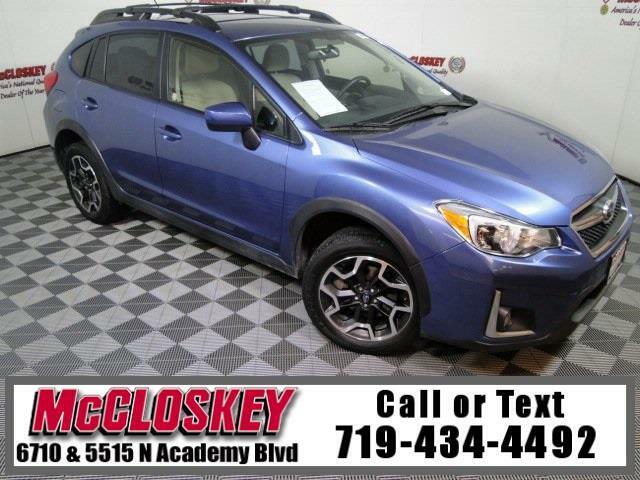 Capable 2017 Subaru Crosstrek 2.0i Premium All Wheel Drive with Keyless Entry, Heated Seats, Premium Wheels, Cruise Control, and Strong 2.0L Engine! The 2.0i Premium adds heated side mirrors, heated front seats, an adjustable center armrest, a leather-wrapped steering wheel, a cargo cover, a removable cargo tray and a six-speaker audio system. The Crosstrek's utility is solid but stacks up differently depending how you compare it. It can tote more than similarly priced subcompact crossover rivals such as the Jeep Renegade and Mazda CX-3. It's easy to see out of the Crosstrek because the roof support pillars are slender, the rear three-quarter blind spot is small, the mirrors are fairly big, and a rearview camera comes standard. This vehicle passed our 110 multi-point inspection and is backed by our National Quality Dealer of the Year Award. We are an ''A+'' Better Business Bureau Rated Business. We offer low interest rate financing, low down payments and the highest trade allowances in the state! Here at McCloskey we do things a bit differently, we shop our competition every day to ensure a great value to you. Come on down and experience it for yourself. This McCloskey Assured vehicle includes a 2 month/2000 mile Warranty and a Vehicle History Report!! At McCloskey we strive to provide ASSURANCE, TRUST, VALUE AND QUALITY! Call 719-434-4492.